Are you a student, or a graduate? Provided you are still young, it’s never too late to start something doing. Time is a continuing progress of existence and events in the past, present and future. Indeed, time is life. Every living thing has life, and life itself revolves around time. This means that every human has time, but the end result is not always the same for all humans on this earth, depending on how well the time is spent. As a student, every time you spend in school matters. Time can be used in two ways; either it is invested or wasted. Time is never stationary and surely, waits for no one. Every great man or woman that ever existed didn’t just become great. Tracing their lives, you will definitely see traits of invested time. I have come to realize that, whatever you spend your time on the most becomes part of you, and you tend to become a master in that field. People – humans in our environment, surround us all. Everybody is born with different minds and different brains. Same way time can be wasted or invested, likewise the brain can be wasted and invested as well. Whatever you spend your time on is what you will eventually become an expert in. It has been proven that, whatever you do for 10,000 hours, you become an expert in that field. A practical example is Bill Gates; brilliant young math whiz that discovered computer programming. Drops out of Harvard, starts a little computer company called Microsoft with his friends. Through sheer brilliance and ambition and guts, builds it into the giant of the software world. That’s the broad outline. Ok… let’s pause for a moment there… you might be wondering and asking, how does this ’10,000 hour rule’ apply? Fine, let’s dig a little bit deeper. 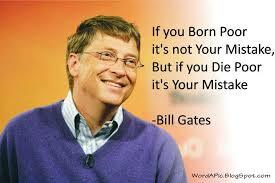 Gates father was a wealthy lawyer in Seattle and his mother was the daughter of a well-to-do banker. As a child, Bill was precocious and easily bored by his studies. So his parents took him out of public school and at the beginning of seventh grade, sent him to lakeside, a private school that catered to Seattle’s elite families. Midway through Gate’s second year at Lakeside, the school started a computer club. 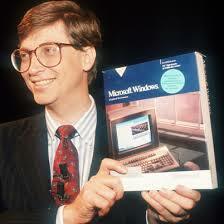 It was this tender age that Gates got exposed to computer. The amazing thing is this was 1968. Most colleges didn’t have computer clubs in the 1960s. Even more remarkable was the kind of computer lakeside bought. Bill Gates got to do real-time programming as an eighth grader in 1968. From that moment forward, Gates lived in the computer room. He and a number of friends began to teach themselves how to use this strange new device. Then, a group of programmers at the university of Washington formed an outfit called ‘Computer Centre Corporation’, C-Cubed as it was commonly called, which leases computer time to local companies. After school, Gates would take a bus to the C-Cubed offices and programme long into the evening. C-Cubed eventually went bankrupt, so Gates and his friends began hanging around the computer centre at the University of Washington. Before long, they latched onto an outfit called ISI (Information Science Inc.), which agreed to let them have free computer time in a exchange for working on a piece of software that could be used to automate company payrolls. In a seven-month period in 1971, Gates and his cohorts ran up 1,575 hours of computer time on the ISI mainframe, which averages out to eight hours a day, seven days a week. To cut the long story short, Gate is popularly known round the world. He did not just climb to the top because he was smart. He did so because he invested his time on a newly discovered ‘Mainframe Computer’ and this computer is the big and heavy type that generates excessive heat. But he didn’t mind, as long as it was interesting and he enjoyed using it. I’m not trying to tell you how to make money, but to enlighten you on how well one can make use of his/her time. One thing I’ve come to realize is that, time is the only currency that’s worth anything in the world. I don’t know if you have ever noticed this, the rich buy time with their money. How? You say. There is a certain stage you will reach in life, that you won’t have time for little things. Assuming you are preparing for an exam and you have 7 hours to the day of the exam. These 7 hours is just perfect for your preparation. Your dad came knocking to send you on an errand, or better still, you have an appointment somewhere. Because you don’t want to miss out of any, you might decide to send someone to represent you for that appointment, even if it involves paying the person. You might think you wasted money, but the funny truth is that, you bought that time. The petty and the mundane steal much of our time. Too many of us are living for the wrong things. In conclusion, setting your priorities right is of big help to time management. Too many priorities paralyze us and when little priorities demand too much of us, big problems arise. The reason why most goals are not achieved is that we spend our time doing second thing first. Once your priorities are set, time management becomes easier. But sometimes, time deadlines and emergencies force us to prioritize. We find this in Parkinson’s Law: if you have only one letter to write, it will take all day to do it. If you have twenty letters to write, you’ll get them done in one day. That’s fact. Like they always say, procrastination is the thief of time. It’s really true. Time and its management are really important for people who want to succeed. Use your currency (time) very well, and you will be amazed how much wealth you have acquired and how free you will be. buddy, and let your coworkers buy their own Shamwows. คิดว่า คิด ฉันโพสต์ ที่จะ แจ้งให้คุณทราบ รูปแบบ ดูดี แต่! ฉัน ไม่ ต่อต้าน ดี เขียน ! รวดเร็ว บล็อกของคุณ โหลดใน มือถือ ของฉัน โทรศัพท์มือถือ ..
ผมไม่ได้ ใช้ WIFI, 3G เพียง ..
and I am surprised why this twist of fate did not came about in advance! Hello Dear, are you really visiting this site on a regular basis, if so afterward you will definitely take pleasant experience. concerning this article, while I am also keen of getting know-how.